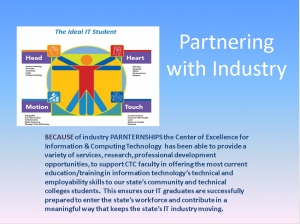 The Center of Excellence assembled an IT industry panel for the “The HR Policy Foundation Workforce Development Roundtable and the Community College Workforce Consortium” on September 30, 2014. Click on the image above to view the video. You can upload the PowerPoint Presentation here. The panel focused on their experiences both with Center initiatives, activities, projects/products related to workforce demand. The panelists also discussed and expanded upon their contributions to a recent Center report, Building an IT-Ready Washington: 2015 and Beyond. The report is a practical resource for IT faculty and student. It offers sound, practical tips, tools, and resources to improve the quality of the classroom experience as well as generate more well-rounded and work- and IT-ready graduates. 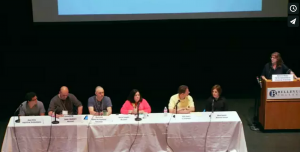 Maureen Majury, M.Ed., Director for the Center facilitated the hour-long panel session.